After a week of robust debate, MPs and political observers welcomed the amended motion of the White Paper endorsed by Parliament on Friday. The changes make clear that the 6.9 million population figure in 2030 is not a target and the Government is not deciding now on any specific population size for beyond 2020. The projections beyond this decade are for the purpose of land use and infrastructure planning. Meanwhile, priority will be be given to addressing current infrastructure bottlenecks. In his speech on Friday, Prime Minister Lee Hsien Loong said that the 6.9 million figure had been taken out of context. The future population, he said, depends on Singaporeans of tomorrow and not the Government of today. His own guess was that it would be somewhere above six million to cater to an ageing baby boomer generation but yet "significantly below" 6.9 million. "Nobody knows what's going to happen in 2030. Even in 2020, you cannot be sure... Therefore we cannot decide on a population trajectory beyond 2020," he said. There will be a review of plans in the white paper closer to 2020, PM Lee added. Mountbatten MP Lim Biow Chuan welcomed the Government's move to stress that the 6.9 million figure is not a target but a planning parameter, and said this now has to sink in with Singaporeans. Holland-Bukit Timah GRC MP Liang Eng Hwa, who proposed the amendments, said: "It's good that we can highlight a few things in the amended motion like the Singaporean core, and the fact that this is not a population target. I think the backbencher MPs were more comfortable with the amendment." The original motion reads: "That this House endorses Paper Cmd. 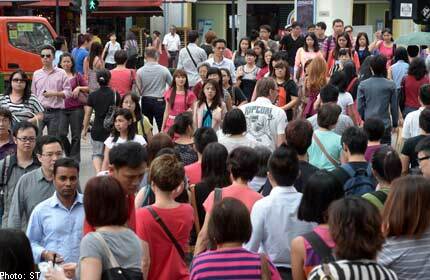 1 of 2013 on "A Sustainable Population for a Dynamic Singapore" as the population policy roadmap to address Singapore's demographic challenge, and Paper Misc. 1 of 2013 on "A High Quality Living Environment for all Singaporeans" as the land use plan to support Singapore's future population." (d) carry out medium term reviews of our population policies and assumptions to take into account the changing needs of Singapore and Singaporeans, as well as changing domestic and external circumstances."